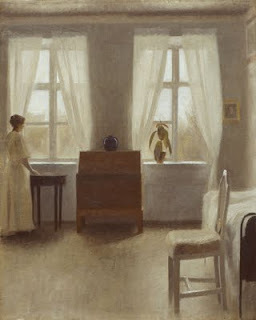 He uses a subdued palette and paints mainly interiors which sometimes feature members of his family. His work reminds me of other artists I really like including Hopper, Wyeth, and Vermeer. There's a BBC Documentary about his life and work that I'm in the middle of tracking down called Michael Palin and the Mystery of Hammershøi.